Some people reading this, including some INFJs, already live their lives in the way I just described. If that’s you, then wonderful! Keep doing what you’re doing (and maybe share some tips for the rest of us in the comments). For others, standing up for yourself is a real challenge. INFJs aren’t the only ones who deal with this either — any personality type can struggle with asserting themselves and practicing authenticity. 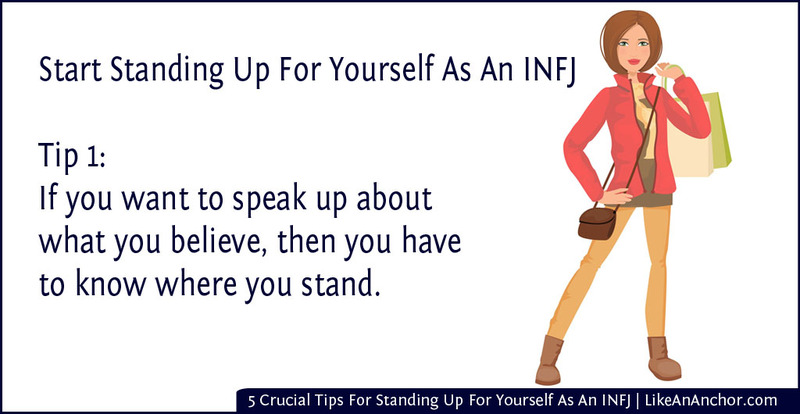 Today, though, we’ll be focusing on INFJ-specific tips for getting comfortable with standing up for yourself. Other IN types (like INTJ or INFP) and FJ types (like ENFJ and ISFJ) might also find these tips helpful. INFJs often struggle with knowing exactly what we believe. Our Introverted Intuition makes it easy for us to see multiple perspectives on every issue and to hold different conceptual frameworks in our minds at the same time. Many of us learn from a young age that most other people don’t see the world the same way we do, so we learn to hide the parts of ourselves that others don’t understand. All too often, that includes staying silent when we have a different viewpoint than the person we’re talking with. If you want to speak up about what you believe, then you have to know where you stand. For INFJs, though, that doesn’t necessarily mean picking just one side on any given issue. We’ll probably have very definite opinions on certain things, typically ones that we’ve thought about extensively. Most of the time, though, our thoughts on something will involve multiple (sometimes contradictory) ideas. In those cases, standing up for yourself might involve admitting you don’t have just one opinion on the subject but you’d be happy to discuss several different ideas about it. This point goes hand-in-hand with the first, but they’re not quite the same thing. This one is more about figuring out who you are and how you want to show up in the world. 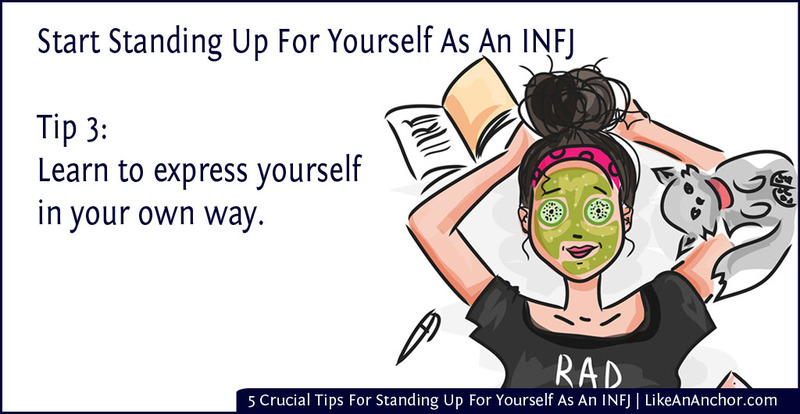 This can be quite a challenge, especially if you’re an INFJ who’s spent much of your life as a “chameleon,” adapting yourself to the expectations of whatever social situation you’re in. 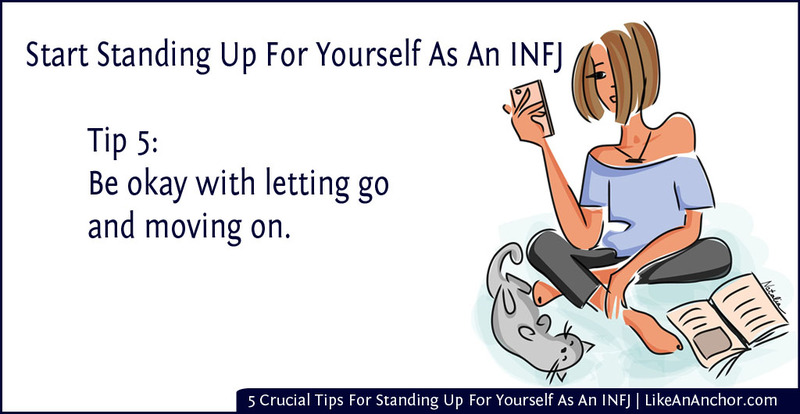 Living authentically as an INFJ means having the courage to be yourself instead of trying to figure out who you “should” be in each situation. 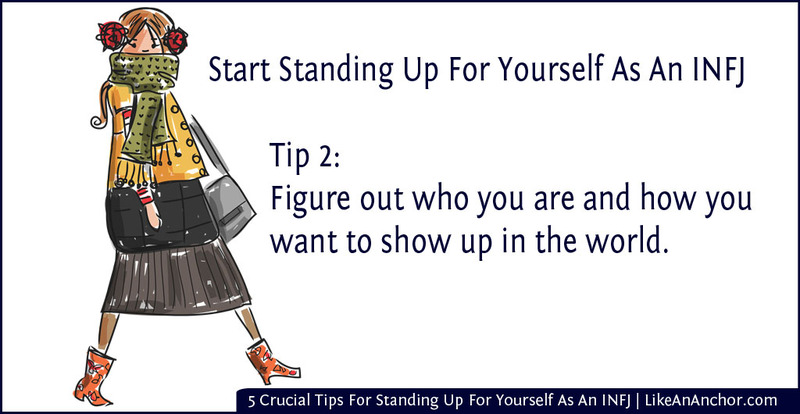 As we work to figure out who we are and who we’re meant to be, it should start becoming easier to “stand up” and be our true selves. It’s a lot easier to share your ideas and choices, and to stick firm to your personal standards, once you figure out who you are and what you want. As INFJs, most of us are pretty conflict-avoidant. Like other FJ types, we seek harmony in all our relationships and disrupting that “just” so we can stand up for ourselves often doesn’t seem worth while. However, in the long-run, dealing with conflicts as they come up actually helps preserve harmony. It’s much better to “stand up for yourself” the first time you think you should say something than to wait until it’s such a big issue that you blow up over it. Finding a balance between too avoidant and too aggressive takes time and practice, but it is possible. We can all learn how to respectfully stand up for ourselves in a way that’s authentic to who we are, and which doesn’t seek to hurt the other person. It doesn’t usually take a whole lot of words to do this. To quote Michaela Chung, “When you are direct and honest, your message is heard loud and clear from the first sentence” (How To Stand Up For Yourself as an Introvert). 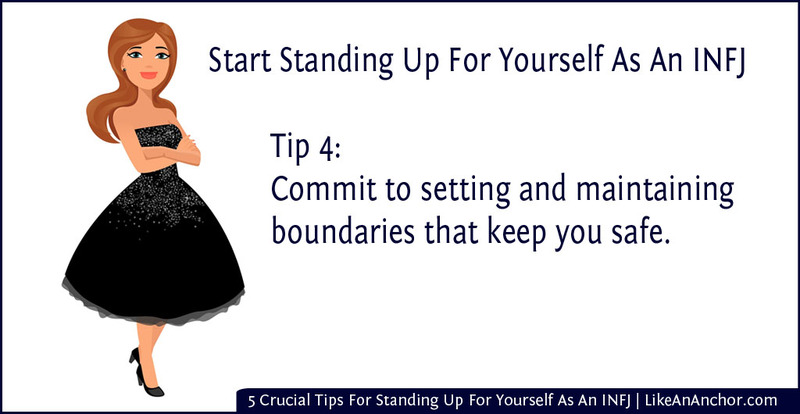 When you first start standing up for yourself, you’re probably also going to be setting some new boundaries. Whenever we assert a boundary that we’d previously left unspoken, there’s a risk of getting push-back from people who though we were okay with their actions up to this point. That can be scary for INFJs, who hate discord in relationships, but it really is okay to prioritize your needs as much as you tend to prioritize the needs of others. Standing up for yourself is a good thing. But also need to be careful not to get overly attached to negative feelings that might come along with standing up for ourselves. Anger, bitterness, hurt, and defensiveness are all things that we should let go of once we’ve stood up for ourselves. Often, it’s pretty easy to move on after we’ve said what we need to say. Sometimes, though, people don’t react well when we stand up for ourselves and the emotions that go along with that can be hard to deal with. Regardless of the outcome, we can’t afford to let negative emotions eat us up. We need to be okay with letting go and moving on. For INFJs, this also means letting go of the other person’s emotions. We’re a highly empathic type, and when we’re in any sort of conflict with someone else we often feel their emotions just as strongly (if not more so) than we do our own feelings. It’s okay to let go of that, too. You are only responsible for your own actions and emotions, not how other people respond. 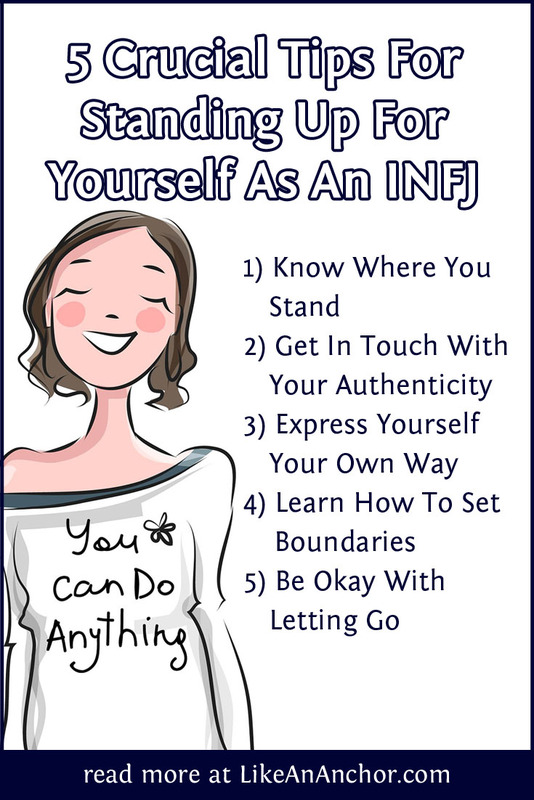 So there you have it — five crucial tips to help you stand up for yourself as an INFJ. These tips are certainly helping me on my personal journey to learn how to manage anxiety and express who I am in an authentic way, and I hope you’ll find them helpful as well. Please share any thoughts, and your own tips on standing up for yourself, in the comments below. I look forward to discussing this with you!